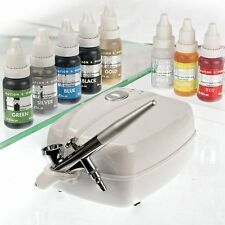 Single action gravity feed airbrush. Airbrush Holder. Gum Paste For the Strip Cutter:HERE. Wow you family and friends with amazing cakes enhanced with air brush techniques. Droplet bottle. We reserve the right to refuse service to anyone. With the airbrush technique you can add beautiful details to your creations. 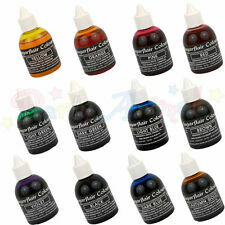 This edible colouring liquid from Sugarflair is specially developed for use with an airbrush (airbrush not included). We reserve the right to refuse service to anyone. More accurate colours. Perfect for use on cakes, gum paste, sugar paste, fondant, pastries, icing, and more. SPECIAL KIT INCLUDES: CARRY CASE, 13 COLOURS, 1 x CLEANING FLUID, AIRBRUSH, HOSE, COMPRESSOR, CLEANING POT, CLEANING BRUSHES,1 STENCIL STUDIO HEART SHAPED STENCIL, COLOUR WHEEL & COLOUR MIXING GUIDE. Using airbrush colours with an airbrush it is one of the easiest and most popular ways to add a burst of colour to any cake. These airbrush colours are compatible with any airbrush kit. The Colour Splash airbrush colours can be sprayed directly onto royal icing or sugar paste and are available in many different shades which can be mixed together to achieve any colour you want. Colours - 4oz (118ml) each. Using airbrush colours with an airbrush it is one of the easiest and most popular ways to add a burst of colour to any cake. 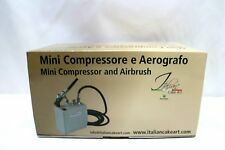 This airbrush colour is compatible with any airbrush kit. The Colour Splash airbrush colours can be sprayed directly onto royal icing or sugar paste and are available in many different shades which can be mixed together to achieve any colour you want. INCLUDES8 COLOUR WATSON & WEBB SET | Less mixing. More accurate colours. Perfect for use on cakes, gum paste, sugar paste, fondant, pastries, icing, and more. 4mm stayclean TM needle is perfect for large jobs or tiny detailing (down to just 1.6mm). Rainbow Dust Colour Flo is a liquid food colouring for adding to your edible ingredients to produce a bright coloured finish. It's ideal for mixing into royal icing, buttercream and are ready-to-use with your air brush too for those all important cake creations. Airbrush Fold Away Spray Booth Turntable Cake Decoration Model Painting SP3512 A versatile fold away spray booth with built-in turntable, three power settings, ventilation hose & easy change filters. Condition is New. 2x yellow BB 2024. 2x yellow glitter BB 2022. These stencils are both durable but with just enough flex to wrap around a project if needed! 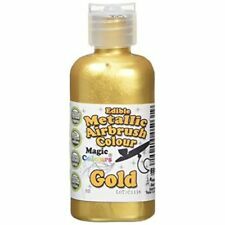 Concentrated Multi-purpose Liquid food colour for Cake Decoration These metallic airbrush colours can be used with 30psi or above compressor. Fast drying and easy to clean with hot water or Alcohol Achieve different results-from covering a cake with thin colour layer to painting as creative as you desire without using an airbrush For external painting (do not knead into paste), 1st layer will be thin, after 1st layer dries, you can add the 2nd for better results For covering,use large brush or sponge, and lightly tap on the baste (brush gently).Wet glaze will disappear after drying.1-2 hours. .
Stencils can be used in various ways, sprayed with lustre sprays, dusted with powder colours, sprayed with an airbrush, with royal icing and even just rolled into paste to emboss the design. We reserve the right to refuse service to anyone. 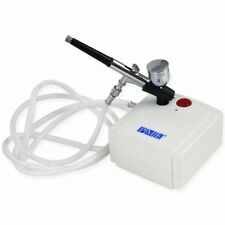 Most beginners and professionals prefer to use airbrush guns for their cake decorations. The Bakell Team worked hard to put together an amazing product for bakers, cake artists and crafters! When buy Bakell, you buy direct and save! 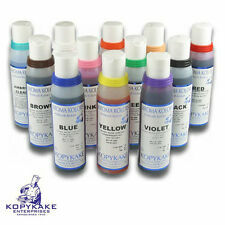 Sugarflair - Airbrush Food Colour Range. These easy to use great colours are supplied in a squeezy plastic nozzle topped 60ml bottle. BLACK - E133, E124, E102 DARK BLUE - E133, E122 LIGHT GREEN - E104, E133 YELLOW - E102 RED - E124, E104 VIOLET - E122, E133 LIGHT BLUE - E133 DARK GREEN - E155, E133, E102 BROWN - E155, E133 ORANGE - E110 PINK - E122 AUTUMN GOLD - E102, E155 PEACH - E129, E102 WHITE - E171. Edible Colour Splash dust with a pearl Rose Gold?í´ÌÎÌ__effect. Perfect for sprinkling directly on to your celebration cakes, cupcakes & treats using confectioner's glaze or edible glue. - Net weight: 5g.